Reliable Equipment Sales Owner Elise Vaughn and Penguin – Filter Pump Industries COO Larry Frederick discuss the latest in pumps and process equipment at Sur/Fin 2017. 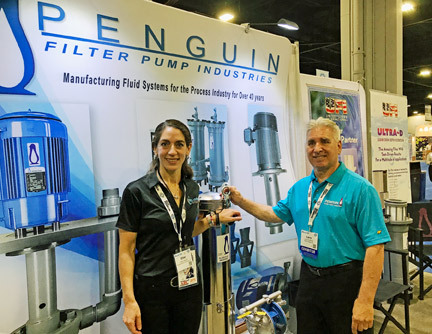 Elise Vaughn of pump distributor Reliable Equipment Sales met with Penguin Filter Pump Industries COO Larry Frederick at SUR/FIN 2017 in Atlanta, Georgia. Attending the National Association for Surface Finishing’s (NASF) SUR/FIN Tradeshow and Conference is critical for distributors to stay up to date on the latest pump, filter and process innovations in plating, anodizing, passivation, cleaning, rinsing and fluid transfer, according to Vaughn. For details on the latest Penguin pumps featured at the show, call Elise at 203-740-1877. See Penguin filter chambers here.